Our good friends and long time email buddies and world sailors, Ed and Sue sailed in from London on their way to the USA east coast. Of course, we insisted that they stop in Marsh Harbor and go to THE JIB ROOM with us for Steak Night! Imagine sailing from London, south to Spain then to the Canaries and across the Atlantic in December into the Caribbean. From the Caribbean, they sailed north and east to the U.S. and Spanish Virgin Islands and then onto Dominican Republic and then north into the Bahamas where they sailed to ABACO. We were so excited to see them after many many years of following their European Circumnavigation via rivers and the Med and then back across the Atlantic. When they sailed into the harbor after 6 days at sea, we gave then a full conch horn welcome and then delivered an ice cold quart of milk and warm homemade bread along with our WiFi internet access code to get online. These are key items for any cruising sailor who has been at sea so long. They were thrilled and grateful. Later that night, we attended the world famous JIB ROOM and enjoyed the best steaks in the world. We watched the limbo show by Desmond and enjoyed the dance music by Jason. It is always a great time and I really enjoy sharing the Jib Room with friends. To me, this is one of our “Happy Places” and if you ever stop in, you will see why. Radeen prepared dinner aboard Island Spirit and we popped a bottle of Champagne that Ed and Sue brought from Spain to celebrate their world sailing tour! What a great adventure. Radeen and I can not imagine crossing an ocean, especially without crew. Hearing their stories about all the places they have seen and all the adventures they experienced was a real thrill. We really admire them for their bravery and sense of adventure. These guys are AMAZING! We next sailed in their direction over to Treasure Cay to anchor for the night. It was quite hot and humid, so we all enjoyed bobbing the afternoon away in the calm waters of this exquisite beach of Treasure Cay. Ed and Sure raised the courtesy flags of all the countires visited over the past few years. What a sight to see a sailboat with so many different country flags (43!) and then to be here in Abaco proudly flying these flags was very impressive. What a lifetime adventure they are having. We are so proud to call them friends, close friends. Ed was a Federal Attorney, look at his boat napkins!!!! What a fun week with college friends Jim and Gail, buddies we have known since 1973! They arrived last Wed. at noon and sadly departed today, Thursday, for their flight back to the cold rainy Northeast. During their visit we toured Man-O-War island and snorkeled Fowl Cay Preserve and Johnny’s Cay near Elbow Cay. We anchored in the settlement harbor on Great Guana and of course compared the drinks at Grabber’s Beach Bar vs Nipper Juice. We concluded that the Grabber’s drink was better but the beach swim and walk at Nipper’s was better. So both beach bars have their plusses. 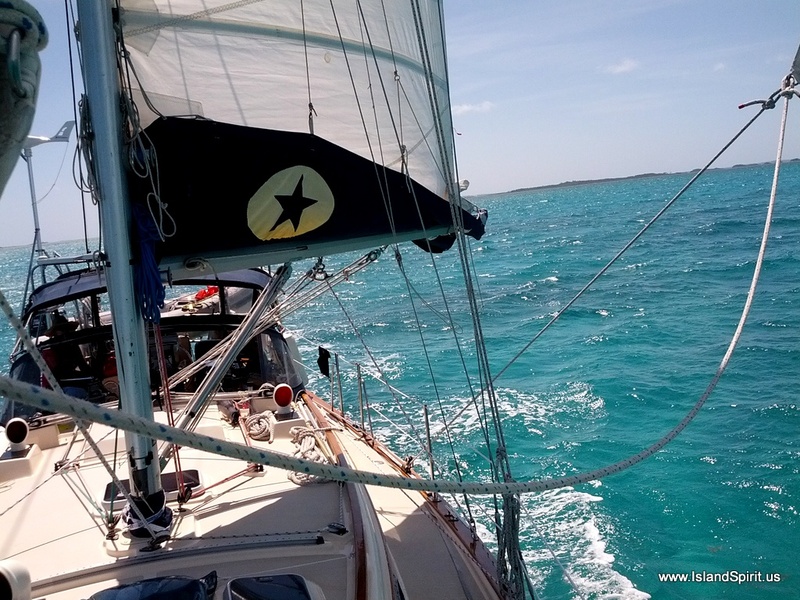 We had a wonderful sail upwind in 15-20 knots from Great Guana to Hope Town where we returned to our mooring ball. Easter Sunday we enjoyed walks in town and a wonderful lunch at FIREFLY Sunset Resort. Later in the day we returned to town via the resort golf cart and enjoyed a swim in the pool with a beautiful full moon rising over the ocean. The next day found us snorkeling Elbow Reef with a reef shark. Tt was a race back to the dinghy to see who could get out of the water the fastest while Jim fended off the shark! Next we moved south to Tahiti Beach for a fun day of playing on the sand bar at low tide where we pitched beach umbrellas, swam and drifted in the warm clear waters between Elbow Cay and Lubbers’ Quarters. Returning to Hope Town we made our way up the Elbow Reef Lighthouse for the lighting by Elvis who has been a lighthouse keeper for 19 years! This is a MUST SEE event. The Elbow Reef Lighthouse is a world treasure and needs to be protected and saved forever. If you ever come to Hope Town, you much see this lighting. As our time was running our, we set sail for Marsh Harbor where we anchored off our favorite place, THE JIB ROOM. No trip to the Abacos would be complete without attending the World Famous Jib Room RIB NIGHT on Wednesdays or STEAK NIGHT on Saturdays. It was our plan to make Rib Night be Jim and Gail’s wrap-up night on Island Spirit and as always, it did NOT disappoint us. The Jib Room simply has the best program with friendly owners (TOM and LINDA) the best food, great drinks by STEPHEN (The Bilge Burner,) best limbo king (DESMOND) and best dance party (JASON). Everyone always has a great time, including the children, the food is delicious and plentiful and the people are fantastic. This is simply one great place and the very best way to wrap up our visit with wonderful friends. 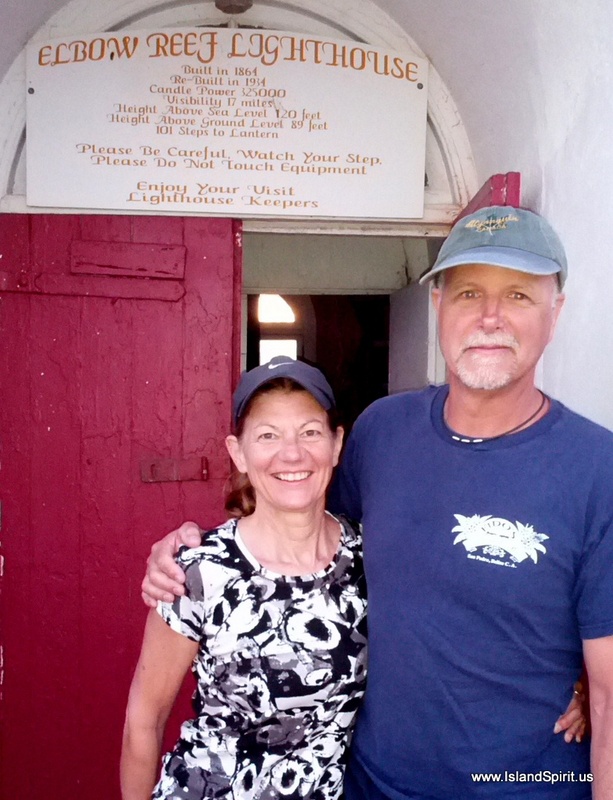 Thank you, JIM and GAIL, for taking the time to visit Team Island Spirit in Abaco. We had such a good time! Here are photos of the past 5 days. We had the opportunity to look inside the lens after it was lit! Departing HOPE TOWN for a great sailing day…..
Why do I love this so much? Why? The Limbo King, DESMOND is the best, no one can go lower, NO ONE! Limbo…..how low can you go? Happy Jib Room fun with Jim and Gail. Do we have to go home? Off to the Airport via cab. What a fun 8 days it has been, full of good chats, tours, sailing, great meals cooked onboard, good drinks and plenty of laughs and fun. It is really a good time to share this cruising life style with close friends. Thank you for sailing along…. …Radeen, Gail, Jim and Hayden snorkeling …..
Life in Abaco Bahamas with college friends, Jim and Gail, is really a fun time. Snorkeling, swimming, exploring areas and sharing great meals and fine wines onboard Island Spirit make for a really good time. Here are some photos of our past few days…..good time…..
Oh My Gosh! Tahiti Beach Day, Snorkeling Day, Man O War Day, Nippers Day, and still sooooooo much more to explore together. 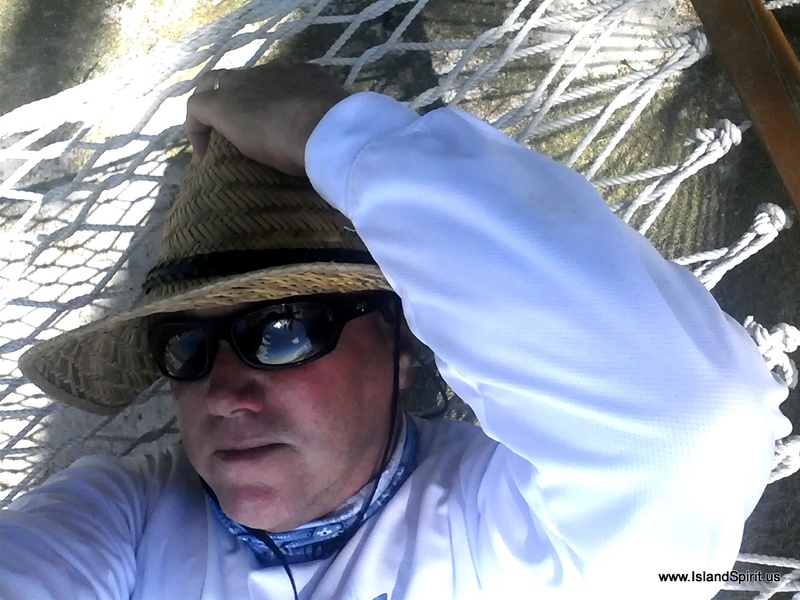 Abacos are great, and the best is yet to be…..JIB ROOM Wed Night!